Discussion in 'Canon FD' started by timwitt, Jan 25, 2008. Please contribute facts with sources and your opinions/comments. code to s/n comparison and help approximate the focus screen change. When did production cease? When did you obtain yours if you purchased it new? This is questionable, see my EF s/n and info below. Can anyone confirm the s/n cutoff? Do you know of any changes during the production period? Both have the old screen. Tim I don't know if I have ever seen any info about when production was stopped on the EF. As to the screen change point your camera could be the one that lowers this number. As far as I know the 330000 point was an estimate developed from known samples collected on various forums and using eBay auctions. It is also possible unless you know the history of your body the screen was changed at some point. Michael You spelled my last name wrong !!! Year 1973; it's got a film in it at the moment so I can't give the date code. Focusing screen is split image with microprism annulus. The EF feels so solid and well built. It's one of the classics. The 330000 estimate for the split-image screen clearly needs to be revised. I suspect that production may have stopped in 1977. With the introduction of the AE-1 in 1976 and other inexpensive electronic cameras, sales of the EF, which were never very high to begin with, probably slowed dramatically. It's interesting that my newest EF has a later date code than Don's but a much lower serial number. I purchased all of my EFs used, so it's possible that the top plate may have been switched at some point. Every time the subject of the EF comes up someone compares it to the F-1. The EF came out in 1974 so the original F-1 is usually the model it is compared to. It is true that both cameras have strong metal bpdies but I've never heard of a camera wearing out because its metal body wasn't strong enough. The EF and F-1 are completely different. The F-1 has a titanium foil horizontally running shutter with a top speed of 1/2000. All speeds work mechanically. It also has the older CdS meter cell. The prism and focusing screen of the F-1 are interchangeable. The F-1 accepts both motors and winders. Automatic exposure only works with the cumbersome Servo EE finder and battery pack. The EF has a vertically running steel bladed shutter with a top speed of 1/1000. If I remembe correctly some of the slower speeds are battery dependent. The EF has very nice Silicon Blue cell metering but if the meter is not turned off when the camera isn't in use the batteries die quickly. The EF has a fixed prism, no interchangeable focusing screens and doesn't accept a winder or motor. I have two F-1 bodies and one EF. I like all of them and I have many other FD mount cameras to keep them company. The EF is very nice but is not as sturdy as the F-1. My EF is #118181 - O406. Microprism spot screen. I guess that's April 1974? pretty early one. Sooooo sorry Mark! It's changed. Richard not to argue but by what measure do you put the EF ahead of the T-90 as an auto exposure camera? It's surely not superior when it comes to function or ability. 0.77x magnification and 94% coverage. The EF's 0.82x magnification, 92% vertical coverage, 93% horizontal coverage. Again nod tot he T90. Now the shutter the EF goes from 30 sec to 1/1000th with 1/125th flash sync using it's excellent copal square metal blade shutter. Well the T-90 has a 30 sec to 1/4000th with a 1/250th flash sync. using it's Canon made metal blade vertical traveling shutter. Flash OH please the 133D system compared to the 300TL???? Now the one thing the EF has all over the T90 is MLU will in stock form. Since the T-90 can be modified to have this feature. And lets talk motor drive/winder OK EF NO T-90 pretty advanced with 3 modes and simple AA batteries and only 4 of them! to power the Beast. True the EF will work from 1/2 to 1/100th as a purely mechanical camera and you can't even get the film out of your T-90 when the batteries are dead. Size and Weight T-90 153 x 121 x 69 mm, 800 g Larger easier to hold with it's ergonomic shape and only 40g heavier that's like 1.4 onces for those of you who never smoked POT LOL. I own both I enjoy both and I know the T-90 and no EF is any T-90 when it comes to ability. And I buy my cameras for their ability to take photo's. I had a feeling there might be a T90 fan or two out there. LOL I'm a fan of BOTH but for different reasons. I have a number of F-1s (and I'm specifically referring to the earlier F-1/F-1n, not the F-1N, or "New F-1"), and I don't find any difference in "sturdiness" between the F-1s and EF. Things I do like about the EF over the base F-1/F-1n (and since they are from the same era, I think it is fair to discuss comparisons between them) is the aperture displayed in the viewfinder, but I do wish it displayed the aperture that the lense is set to even when not in A mode. I also like the overhanging shutter speed dial, making it easier to change shutter speeds. One thing I don't like about the EF is it doesn't tell you in the viewfinder when the lense isn't in "A" mode. I like the rubber eyering of the F-1 better than I like the large rubber eyecup (same as the A-1). I think the EF is a great camera, that few seem to know about, and this thread is a great idea. The service manual is available on the Internet, it contains schematics and *some* repair info. It's not as good as the other repair manuals for other Canon cameras, but it's something. Also, the instruction manual is available as well. This thread is creating good serial number info. So far, lowest s/n with split-image and microprism ring is Gordon's 2828XX P621 (06/1975) also Gordon has the newest EF with a date code of R632 (06/1977). . This may indicate the switch to split-image/microprism ring occured sooner than previously estimated (330000) and the EF was manufactured at least until June 1977. WE NEED MORE DATA, Please contribute your s/n, date code and purchase date if you bought it new. Another thread for creating good serial number info. I have 2 EFs, #s 319421 (P1125/Nov.1975) and 337277 (Q528/May 1976.) Both appear to have the same focusing screen. Always wondered what everone was talking about. Unless one of mine was changed out; Although both were bought used there is no reason to think so tho. I have two EF's: First #211033 with date code O 1213. Second #386002 with date code Q1131. The older one is microprism, while the newer is rangefinder/microprism. Another curious thing I just noticed is on the older one the hot shoe is all chrome with the usual Canon 2 contacts on the right rear, while te newer version has a hot shoe with chrome sides but a black base. Does anybody else have this, or perhaps the older one is missing a black insert. Both were bought used. All of my EFs have the same black base hot shoe. Bob, does your all chrome shoe match the one on the FTb? Maybe the original one was replaced at some point. I have several versions of the "Canon 35mm Single Lens Reflex Cameras" brochure. The 01/1975 edition shows a microprism focusing screen for the EF, while the one dated 01/1976 shows the rangefinder/microprism screen. June 1975 and serial numbers beginning around 282000 seems to be a reasonable estimate. I own two EFs: One from April 74 with date code O406 and s/n 113563 (microprism), the other from April 76, date code Q427, s/n 349949 (split image / microprism). I do like the self timer on the EF a lot. I used A-1s, F-1s, F-1Ns and T90s. All these bodies meter, stop down the lens (unless you stopped it down manually before releasing) and flip up the mirror at the end of the delay interval. This causes vibrations. EFs have "mirror prefire" like some modern EOS bodies. They meter, stop down and flip up the mirror when you press the release button. Vibrations can die out before the shutter fires. I want to call attention to Michael's website EF page from his post Jan. 26. It is really nice with great photos of a fine EF, maybe some of this information will be worthy of addition or update to his EF page. My EF hotshoe has a black bottom (where the contacts are) and chrome sides just like my black FTbn. Keep that data coming, Please contribute your s/n, date code and purchase date if you bought it new. Update on serial number data. The lowest s/n is Ralf Guetz,. .s/n 113563,April 74, microprism. The highest s/n is Henry Clark,. .s/n 4216xx, split microprism. Henry, please post your date code when you finish the roll. You mention 1973 in your post but your EF should be the newest one here, newer than 02-1977. Newest with microprism, Dave Sims, s/n 2785xx,Apr-75. Oldest with split microprism, Gordon Yee, s/n 2828xx,Jun-75. This is the current dividing point of focus screens. Mark, I'm sure you have split microprism but your post does not mention it. Please confirm. I stopped at a pawn shop today.....they had over a dozen digital point and shoot things and on the floor behind the counter, there was a poor dog of a camera whimpering to go home with me, thus I add EF s/n 115745,March 1974, microprism to our list. Looks a little rough but it won't look too bad when cleaned up. Everything seems to work, needs light seals and mirror bumper. I couldn't just leave it there whimpering, I do have a conscience, what was I supposed to do? Attached was a nFD 35-105 f3.5,looks good but loose between the aperture ring and zoom ring, also a nFD 100-300 f5.6 looks good, shot two frames with it today. Everything was dirty but they cleaned up fine.They wanted $100, I took it all for $50. sn 226695, O1114, microprism only. I agree with many here. A beauty of a camera! What I like best is the overhanging shutter speed dial and MLU!! I still wonder who decided MLU was no longer required. My EF serial #225010, date code O1013 microprism only. Yes, soon I'll be member of the "Black Beauty Proud Owner Club" (B2POC). My future EF is now shipping from USA to Europe and is one of the last, or at least the biggest s/n seen on that forum: 423124. Until her arrival, I'm playing with my FTb-New "Tank" (actually testing Pentacon6 lenses), while my father is using the F-1 New for botanical macro. The AE-1 "fleet" is waiting for next film. One of these AE-1 was my first modern camera when I was teenager before that I dicovered photography with my father's first camera (Adox Polo) and with my beloved Voigtlander Vitessa L.
I just pulled mine out of the Bay, and found this thread looking for some background on it. Michael, great website on the EF, thanks for posting that. Nice camera, by the way. I may have to pick up a few more of these. I traded in for a F1N together with a A1 but missed it since then ! Finally got it back ( Ebay) SN 316493 ( 1974) used but very nice! No huge revelation from me on the 330k division, but here they are. My serial n° is 348691. It has the split-image and prism circle. 422450, July 1977, in box never used. Can someone tell me if this s/n would be one that has both the split image & microprism screen in it??? The serial number on the back of the EF camera body is: 420507. I have s/n 406726. Microprism with split image focusing. I purchased it in 1980 for $400. I remember it was about the same price as an F-1n. I remember reading about the end of prouction in one of the magazines (Popular Photography?) in the mid 1970s. I thought it was 1976 but based on the posts above it must have been in 1977. Mine was a leftover NOS. EFs never were great sellers; I suspect because it was relatively expensive, the lenses were relatively expensive, it was physically large, and the automation was shutter priority rather than aperture priority. I bought the EF for a trip to Japan that summer but I never did warm up to the center bottom averaging meter nor the automatic exposure so I bought an F-1n in the fall of 1980. Thus, the EF is pretty much in mint condition. Pat, A serial number that high would surely have a split-image with microprism ring around the split. I compiled an Excel list of the serial number/focus screen info but I can't find it. It may be on an archive disk somewhere but the info in this thread tells the story anyway. Thanks, Tim, I appreciate the confirmation of what I "thought" would be the case regarding the focusing screen. Pat, Speeds from 1 sec to 30 sec are electronically controlled and that is what is blacked out on your camera. I assume a previous owner did not use batteries (meter won't work), shot Sunny 16 or used a handheld meter and blacked these out to help keep him/her from using 1 to 30 sec (needs batteries) and just used 1/2 sec to 1/1000 sec. Bulb also does not require batteries. The original color of the shutter speed numbers are white for 1 sec to 1/1000 and Bulb, orange for 1/125 sec (flash sync), yellow for 2 to 30 sec. Why didn't Canon color 1 sec yellow since all other electronic speeds are yellow? I think orange is fine for 1/125 flash sync to call attention to it but they could have colored 1 sec like all other electronic speeds and maybe a previous owner would not have blacked out all electronic speeds. FYI, photos you want to show in a posted message must be no greater then 700 pixels wide and no greater than 100 kb and have a caption, anything larger than these specs automatically becomes an attachment. Tim, thanks for the info. I assumed that that is what someone did, but, with the help from a little rubbing alcohol and cotton swabs, I've removed the black ink or whatever it was, and the numbers are legible once again. Thanks again for your info., though, I certainly do appreciate it. I'm afraid I don't know where to look for the date codes. The lowest s/n is 109438, February 74, microprism (Brian Grossman's). No news regarding the current dividing point of focus screens, it's still between s/n 2785xx, Apr-75 (Dave Sims) and s/n 2828xx, Jun-75 (Gordon Yee). I will check the SN on my 'new' EF later. Mine has the split-image viewfinder, so it's a later model. What a beautiful camera! The serial number on mine is 388565 . My 1st EF body s/n: 230150 / date code: O1015 / center spot microprism. Acquired in used but very clean condition one week before X-mas 2009. One issue so far: battery check LED always stays on with batteries installed - even when main switch is turned OFF. Meter works correctly, otherwise. I love it so much, I bought another one two days after new year 2010, again, from the local C/L. This 2nd EF body s/n: 219863 / date code: O1013 /center spot microprism. This one looks to have been through a lot more use (some brassing on top plate edges) and seems to have a complete opposite malady as the 1st one whereas the LED only flickers sporadically. It won't light up even when the red B/C button on the bottom of the camera is pressed. Oh well, at least the meter and everything else seem to function correctly. I will post other findings as encountered. Meanwhile, any suggestions/advice on how to remedy the buggy LED quirk will be much appreciated. Thanks in advance and Happy New Year to all. Hello there,first wish you all Happy New Year. OK, still not a fan but here are the details of my EF. Serial 275542. Prism only. Date code P420, so April 1975. I did not read well the earlier respose on this forum.Now I know the date code.It is P 420.And it has the same date code as that from Barry Reid ,who has a respose after mine.So hope it helps to collect information for Tim Witt. Hi. I am happy to see many more fans of what i concidered to be the perfect manual slr. I bought mine used about 2002 and it has been my main camera ever since. it was like new when i bought it and now it is geting well brassed! the s/n is 322261 with the split image. Still in love with it. I guess I'm just a sucker for a nice, clean EF kit. My latest one has a s/n of 4064xx, a build code of R231 (Feb 1977) and the split-image RF w/microprism collar. The camera has very little brassing and came with three minty breech lock lenses, an FD50mm f/1.4 SSC, a convex FD35mm f/2 SSC and an FD135mm f/2.5 SC. My EFs serial number is 2689XX it has the microprism screen and it was made in August 1975. Last week on fleab... temptation was too strong, how can I resist to a nice EF in direct sale for 30€ with saler living just few km from my place. Conclusion, I'm weak and now proud owner of a 3rd "Black Beauty". 66 EF are actually owned by 48 happy members of the forum. 13 owners have more than 1 of then, it's more than 1/3 ... Black Beaty is a love affair! Asap some scan of pics shooted with one of my EF. Waiting process and scan of pics shooted with one of my EF, here a pic of my 3 Black beauties. - the "new" one (microprism 1975/01) without strap and mounted with 28/2.8, I prefer my 24/2.8 but it's actually used by my father on his F-1 New. - the previous microprism (also 1975/01) mounted with a nice chrome-noose 50/1.4. - the youngest EF known on that forum (1977/07) mounted with 85/1.8, I like that lens! One day I hope to have the opportunity to buy a 80/1.2L but until that pontential future, I have lot of pleasure to shoot with the 1.8 version. My Black Beauty arrived from the local 'Bay today. Slightly brassed on the corners but otherwise looking good. I'll put a roll through it before sending it out for a CLA. Apart from the MLU, one feature which Canon should have kept up is the ability to load the film and keep winding to frame 1 without having to fire the shutter for each frame until you hit number 1. No brainer really. Perhaps it was too hard with the film advance mechanism used for the A series. (I still like my AE-1 and A-1, whilst my T90 has been a bit neglected lately). Apart from using my FD glass it will also become a superior platform for my M42 Takumars. I always wanted a Spotmatic with a) Silicon photocell metering - ala Fujica ST605N plus b) Copal square shutter - ala Yashica TL Electro X and I get a more robust body into the deal. I have to say that the old Takumars look very at home on this metal-bodied monster. My FDn lenses look more at home on my Canon bodies. The only Canon breechlock lens I have which cosmetically suits the EF well is an FD 85-300 SSC f4.5 which is a bit of a beast to lug around and generally requires at least a monopod for stable shooting. Ah well, there will a lot of lens swapping between this buch over the next few months. Date code is P117, Jan '75? Serial is 235499 and it has microprism focus aid only. 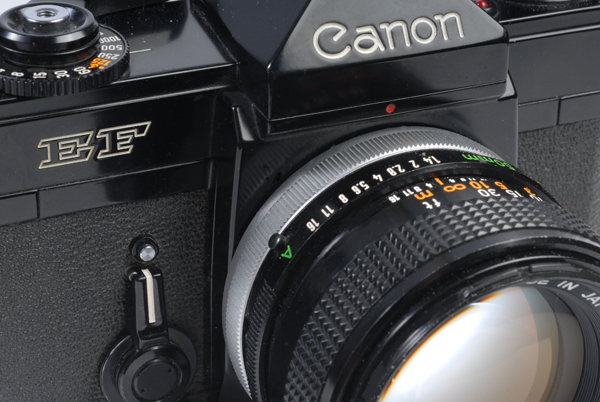 I live in the Netherlands and have been fascinated by Canon's F1 and EF ever since I first saw them in the mid-seventies. Unfortunately, they were simply too expensive, so I bought the FTb that has served me faithfully for over 30 years. With the advent of internet and eBay, I jumped at the opportunity of finally being able to acquire the cameras of my dreams at affordable prices and since then, have garnered a small collection of Canon, Asahi Pentax, Olympus en Nikon SLRs. My two Black Beauties were both bought on eBay in 2008 and, apart from the usual slight brassing, are in mint condition and work like a breeze. Nr. 226083 (from Spain) has the microprism, nr. 383330 (from the Netherlands) has the split-image focusing screen. When I had my first EF serviced, my excellent camera tech Will van Manen - who, if I remember correctly, used to work for Canon and actually contributed to the EF's development - told me about how the EF was intended as a 'new improved' F1 and removed the base plate to show me some 'evidence': provisions for a motor drive that was never to be. And anyone ever wondered why the EF has a removable back? Microprism ring with split-image focusing screen. It's a very nice camera and just resealed it using Jon Goodman's kit. Everything seems to work and the shutter speed seems accurate so Iwill run a roll of film through it before having to send it in for a CLA. Well Tim... it looks like Jerome has the earliest split-image at 272115. But Barry on 1/6/10 says his 275542 has micro-prism only. So what do you think? Hey everyone, I picked up an EF about a month ago in really clean cosmetic condition, unfortunately the electronics aren't functioning (even with new batteries installed) so I've only been able to use it mechanically w/o batteries. I resealed it myself and ran some film through the camera, everything came back just fine, no light leaks or anything like that. Anyways, my camera has SN: 394429 and date code: R131. I actually have the original paperwork that came with the camera, as well as the original purchase receipt from 1977. I'm a T90 fan myself but I do enjoy this camera. I may or may not send it out for repair. I still kind of want an F-1 (as well as an EOS 1N for all my AF lenses ) so it may head off to a new home eventually. I'm new to photography and have been looking for a camera to learn about picture taking. I did some research and found the Canon EF to be a very good camera. The only potential issue appears to be the 1.3 volt mercury batteries. Mercury batteries are no longer sold in the U.S. The Canon EF relies on the battery for the metering and having anything but the mercury-based 1.3volt batteries will affect the accuracy of the metering. Has anyone encountered this problem? What replacement batteries are available on the market? And are they reliable and easy to find? Ben, you're right. I used the 1.5 volt alkaline batteries and fired a roll of film. The pictures came out properly exposed for the most part. The only quirk that I see is the difficulty in making exposure compensation for objects with below or above average reflectance. When you are using automatic exposure, I'm not sure how the camera handles exposure compensation. Also, if you want to shoot manually, how do you go about this? I tried to move off AE by adjusting the lens mount to the aperture setting, but the viewfinder's f-stop reading didn't change to the aperture reading. I'm not sure how the f-stop needle works in the viewfinder when you are in manual mode. Got a brassing EF, #310614, got film atm so cant get the date code, split ring with microprism. Got px625 alkaline batteries, metering just fine. Only problem I got with it is, dust behind the focus screen, however I read on wiki that its not user serviceable, I'd like to think otherwise, anyone got tips? By the way flash sync cable should be compatible with any of the newer flashes with the sync port right? I got an Ef Canon from my father, I'm pretty sure he bought it in the 70's. I don't know how to use it yet but I want to learn, that's why I ask any of you guys to help me find the manual. I'm a big fan of this old cameras and I'd be really tahnkful if you can help me. Thinking of selling the newer body for parts since the spring that returns the mirror is broken...but maybe I should keep it in case the other one has an issue since it seems that parts are becoming a concern. Gotta keep the thread going. Just bought a clean, unbrassed EF which appears to be a very 'low-mileage' example of the breed, judging by the immaculate condition of the pressure plate, film chamber etc. Seals are soft but this one is definitely worth a light CLA and will be sorted out. #379601, Date code Q113J - 1976/? and it has the split screen focussing aid. Great cameras,have 13 of them all beauties,and worth their weight.I suggest if you aren't going to use these cameras, and that would be a shame,you should keep them for awhile as their value goes up each year. If you want to know more about them please feel free to post or contact me. Okay now,older EFs had electrical problems.And batteries are hard to find.most EFs have faulty battery test circuits,exposure meters and shutters. These are all repairable(unlike later canon cameras i.e.(A1-T90). If you want to sell them I'll buy, but get them working first and the make up your mind. Currently offered on ebay (3 October) from Canada is the earliest serial number 105798 and engraved on the back to left of the on/off switch is the word "DUMMY." This is a fully operational Canon EF camera. Canon EF 229103 Microprism only. My Canon EF is S/N 269867 made in August 1975 and has the micro prism only focusing screen. My Canon EF I bought in the fall of 1975. It has serial number 267435 and the code inside the film chamber is P520. Microprism only. I realize that this is an old thread, but: I have two EFs SR# 3921** and 3958** Both with date codes of Q1131. Both with split screens. I believe I don't have anything to contribute to the attributes of these fine cameras, that's already been said. I enjoy using them due to the long shutter speeds available, and because of the MLU. Hello. Kind of an old post but here I go anyway. I have an EF Black Beauty purchased new as old leftover stock in 1980 from a large NYC camera store (forgot who.) I "believe" it was right around $400 at the time? I bought it after reading an article I still have from Modern Photography, April, 1980, "Ten Late, Great SLRs!!" where they lament what a good camera it is and how it was not all that popular when first introduced. The article also mentions that used ones are scarce and can command premium prices up to $300. Mine is a later model S/N 404019. It appears to have a black ink stamped R331 stamped on the side of the film canister cavity. I LOVE this camera and it has served me well although it has not seen more than a few dozen rolls of film (I have a lot of older late-1970's-80's FD Canon equipment, bodies, lenses.) A wonderful workhorse camera, gets great exposures on finicky-exposure slide film with modern 1.5V batteries, no mechanical or electrical issues after 34 years. The only service so far (in 2010) has been to replace the deteriorated mirror cushion and door seals. Although it is likely due a good CLA by now, it still functions well at all speeds. One of the best models ever from Canon. A true classic. Your (beautiful) Canon EF was indeed for demonstration by Sales staff and was not intended for sale. They were fully functional but some (not all) had holes drilled in the body next to the door hinge to prevent actual use as there was a light leak of course. The holes (3 mm) are of course easy to close and new leatherette outside and black tape on the inside did the job. The EF was intended to become a new generation Canon cameras. As you can see when you remove the bottom , it is already prepared for the use of a winder and with most EFs there is a screw in the hinge to remove the door but mostly it is blocked. Also, some of the cameras have in the bayonet mouth on the self timer side two pins intended for automatic lenses. But the electronic development of the AE1 series made that a dead end. It was also the first camera to have a copal square shutter and a completely new mos fed electronic circuit that was reliable and accurate but very difficult to repair. The first series also suffered from dead battery checkers. You can indeed use 1.5V batteries without any problems. This is a rare camera as there were only 100 made worldwide. I've finally picked up a Black Beauty, although a very battered example. The prism housing has taken a heavy fall. I thought it was worth punt for the 50mm 1:1.4 SSC. I thought the electrics were dead when I got it, but playing with it tonight & the battery check started flashing. Checked the meter & it appears to be working as well. The only issue is the on switch won't stay on. Is this fixable? 374366 with split screen focus. Absolute joy to use, feels silky smooth despite seeing a lot of action prior to my ownership. I'm resealing mine this week! Just received my "Black Beauty" and what a beauty it is too. Serial number is 329152 and date code is P12 25 (December 1975) and I'm looking forward to running a film or two through it.